If you are using Windows, you need to download the installer (Windows binaries), scroll down to “Download section” and download the Windows binaries. You can then proceed to extract it and run the application file in your Windows computer. 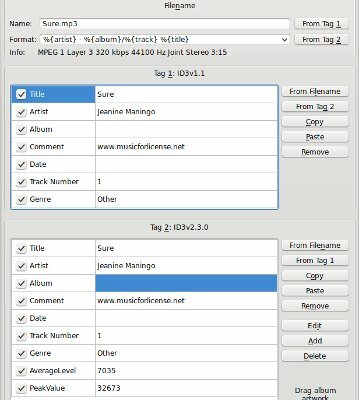 So how you will be able to edit the ID3 tags of the MP3 file? 1.) Once the Kid3 is launched, go to File – Open then select a sample mp3 file in your computer. 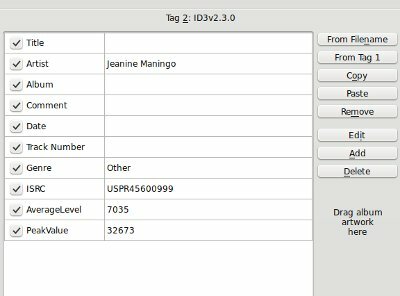 Kid3 actually allows you to edit the ID3 tags for two versions: ID3V1.1 and ID3v2.3.0 which are commonly used for most MP3 players. Now how can you add ISRC code to an MP3 track using Kid3? 1.) Open the MP3 file without ISRC code using Kid3. 2.) 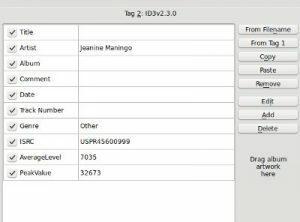 Click “Add” which is found under Tag2 ID3v2.3.0. 3.) Under “Select the frame ID”, select “ISRC” from the drop down menu then click “OK”. 4.) 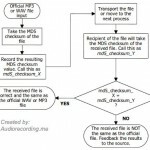 Under “Text”, enter the unique ISRC code you need to assign to that specific MP3 file. You do not need to include hyphens in the ISRC code as they are not part in the code. 5.) Finally click OK, the ISRC tag is then added to the MP3 file. 6.) Go to File– click “Save”. 1.) Always assign ISRC codes when the MP3 masters are now final and decided. 2.) Distribute all MP3 for download or sell with ISRC codes on it. 4.) Radio stations and other broadcasting stations do use ISRC to track the playlist performance of recordings. So make sure you have them before submitting songs to radio or other broadcasting outlets. 5.) Always monitor all ISRC assignments that you make in a spreadsheet file. This makes it easy for you to manage all of your MP3 masters with their corresponding ISRC codes. 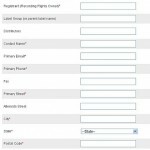 This could also help resolve the confusion of assigning new ISRC codes from new sound recording versions of your songs.